This is the definitive botanic guide to the wetlands, woodlands, coastlines, hills, and valleys of the beautiful and diverse San Francisco Bay Region. 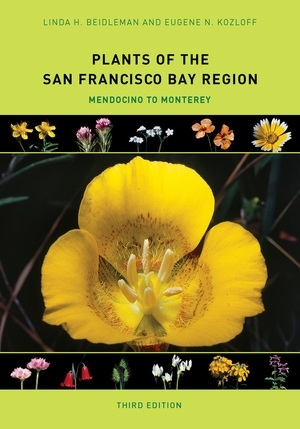 For this extensively revised and redesigned third edition of Plants of the San Francisco Bay Region, the identification keys have been thoroughly updated to include 21 new families, 155 new species, and approximately 330 changes in the scientific names, ensuring that this popular book will continue to be the most comprehensive and authoritative identification guide to the region’s native and introduced plants. • Easy-to-use keys describe more than 2,000 species of wild flowers, trees, shrubs, ferns, and weeds. • Hundreds of line drawings and color photographs support accurate identification. • Plants are identified by both common and scientific names, making this guide an essential resource for amateur naturalists, students, and professionals. Linda H. Beidleman has been an instructor at the Jepson Herbarium, University of California, Berkeley; the Aspen Center for Environmental Studies; and the Rocky Mountain Nature Association, among other institutions. She has coauthored several books. Eugene N. Kozloff is Professor Emeritus at the University of Washington and has written several books, as well as numerous research articles about marine invertebrates.